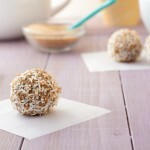 8 ingredient rum and raisin balls sweetened with maple syrup and rolled in toasted coconut. Spread coconut out onto a baking sheet and toast for 2 minutes. Watch carefully to avoid burning it! Once toasted, set aside. Add all wet ingredients to the bowl of your food processor and process until smooth. Add ½ cup toasted coconut and all other dry ingredients to your food processor and pulse until combined but still chunky. 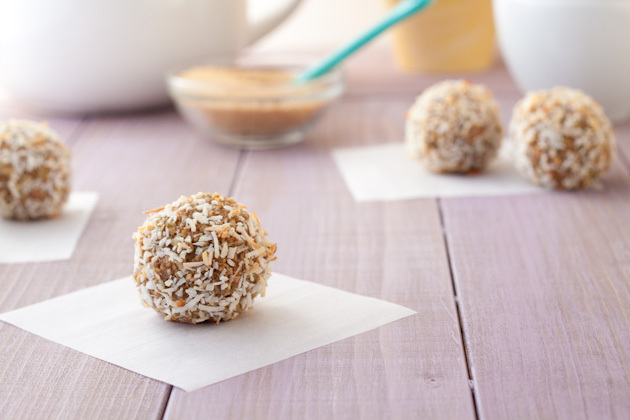 Roll into balls and roll in reserved ½ cup toasted coconut. Place balls on a baking sheet lined with parchment paper or a silicon baking mat and bake in 350F preheated oven for 8-10 minutes, or until golden.